This tourist Trail is a sign posted walking tour through some of the most interesting parts of the city of Sligo – to find out more about this tour click HERE…. The rugged coastline of County Sligo plays hosts to some of the world’s top class beach and reef breaks. From Streedagh in North Sligo , to the seaside village of Strandhill, and the beaches of west Sligo – Aughris, Easkey and Enniscrone – you will find great surfing waves. Kite Surfing is also very popular and you can often see the kites flying high as you look onto Streedagh or Rosses Point beaches. Find out more about surfing in Sligo. Sligo boasts magnificent championship links courses along the Atlantic seaboard and provides some of the most challenging and exhilarating golf in the world. Play parklands if that’s your thing over fairways adorned with mature trees and natural water features. Great value and superb golf guaranteed. Because Ireland is an island on the western edge of Europe and is situated right on the Continental Shelf, we are the perfect location for scuba-diving. The waters around Sligo in Ireland’s North West are of excellent quality and standard, and encompass all individual requirements from the beginner to more experience diver. Access to Sligo is also relatively easy, giving divers the opportunity to travel in just 2.5 hours from Dublin or Belfast for one, or more, day’s diving. You cannot visit Sligo without a visit to Lissadell House and Gardens which are famous as the home of Constance Markievicz when she was growing up. Constance Markievicz was one of the leaders of the 1916 Rising who fought in St Stephens Green, Dublin during the rising and was the first woman to be elected to the House of Commons at Westminster. No stresses. Just maximum relaxation, reading, swimming, steaming, reflecting, contemplating, hanging out, jumping onto a bike for a free discovery of the freshest of fresh air. Relax back into a luxurious steaming bath of fresh seawater and wild organic seaweed. Floating effortlessly in a soothing and tranquil state, your skin feels smooth and renewed. Experience the diversity and vitality of our traditional culture; what makes Ireland unique. For the best of traditional Irish culture visit Ireland’s North West. You won’t have any difficulty in tracking down a music event, be it a traditional music and dance show, concert or pub session, most of which are free! Why not spend the perfect afternoon or evening in a local music venue or lively pub? If you’re feeling energetic, get your dancing shoes on and join in – you can learn the steps as you go. There’s something to suit all ages, and all the family can join in. 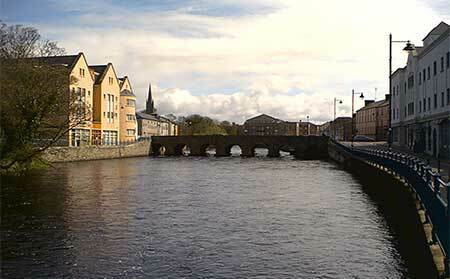 Aer Arann operate a twice daily service between Dublin and Sligo. Airfares commence at just €27* one way and flight time is 40 minutes. Book early for best fares. See www.sligoairport.com or call Sligo Airport on 07191-68280.